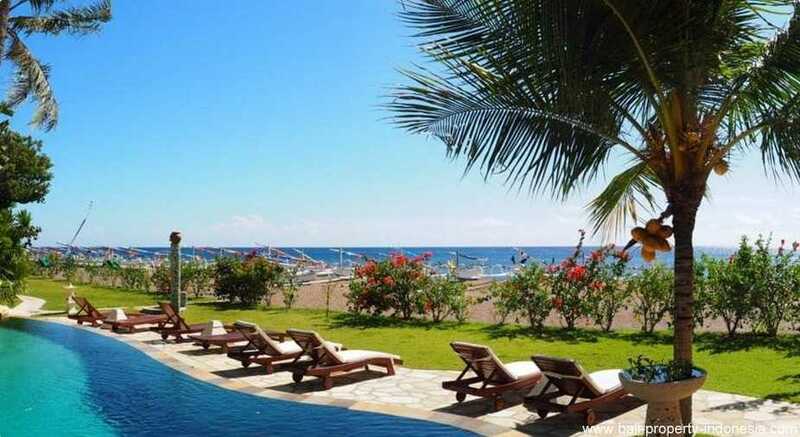 Located in Amed on a beachfront freehold plot of 2700 sqm. A Hotel & Spa Resort offering 11 accommodations and an excellent yearly revenue. 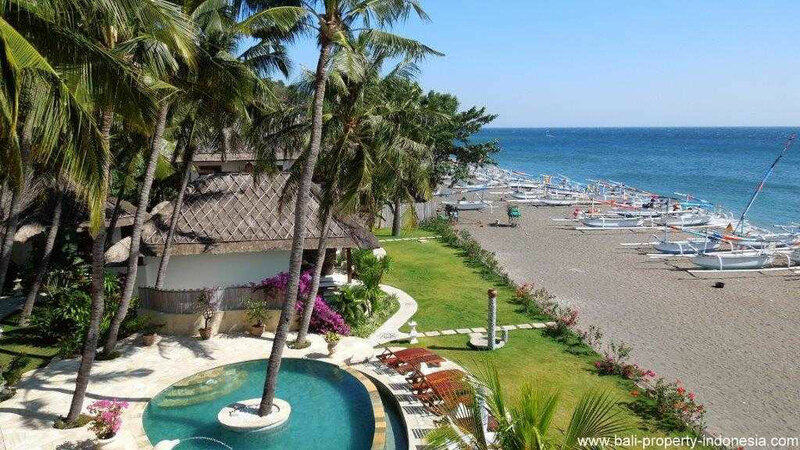 Situated on the north-eastern coast of Bali directly on the black sand lava beach lies this Hotel & Spa Resort. Amidst dozens of shadow- providing coconut palm trees it is harmonically embedded right at the beach. 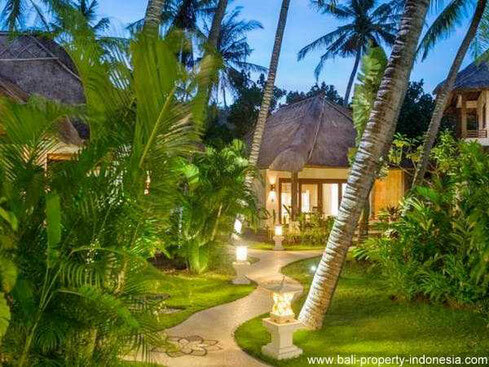 Away from the mass tourism, you will find the original and authentic Bali with its unique cultural flavor and the traditional lifestyle of its local people. Every day your guests will witness the spectacle of the local fishermen on their picturesque outrigger boats returning home from their morning routine. A cool refreshing bath in the large open swimming pool is complemented by a spectacular view overlooking the crystal-clear, turquoise ocean and the nearby coral reef beneath. 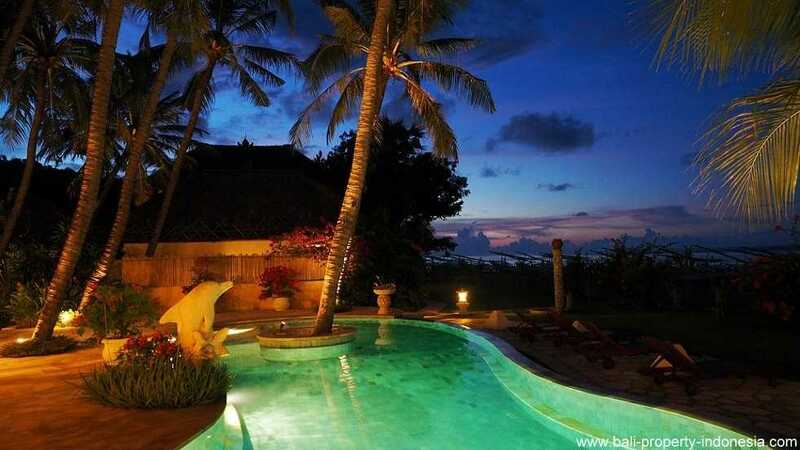 The resort comprises 5 villas, 3 attached bungalows, 2 oceanfront villas including private pool. 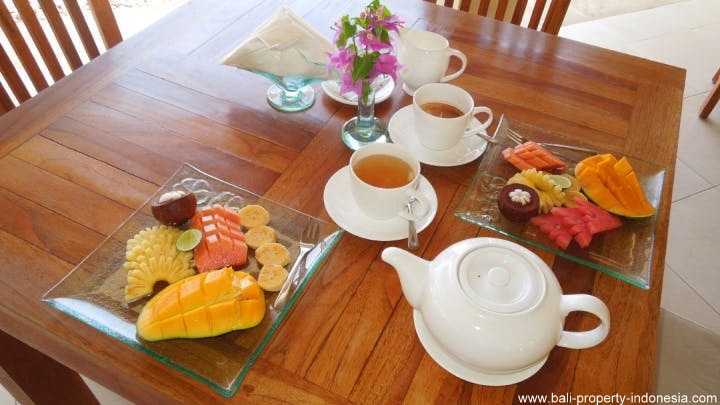 Further, providing a spacious restaurant, spa, major swimming pool with attached sunbathing area as well as outdoor showers, boutique, laundry and free Internet. 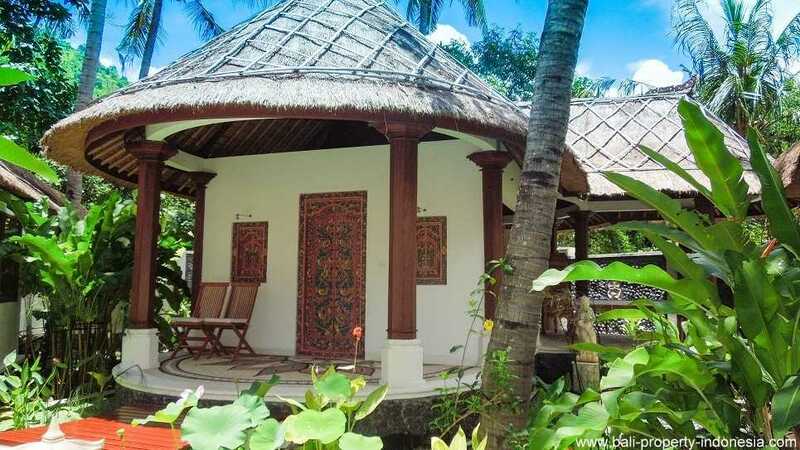 The accommodations are created as a combination of western comfort and traditional Balinese architecture responding harmonically to the rural environment and the untouched beauty of nature. The entire complex radiates an atmosphere of special calmness and peacefulness. Decorative Balinese arts carefully crafted from stone, wood and bamboo integrate beautifully with the tropical lush garden and its meandering mosaic walk ways, lotus pools and water lily ponds. 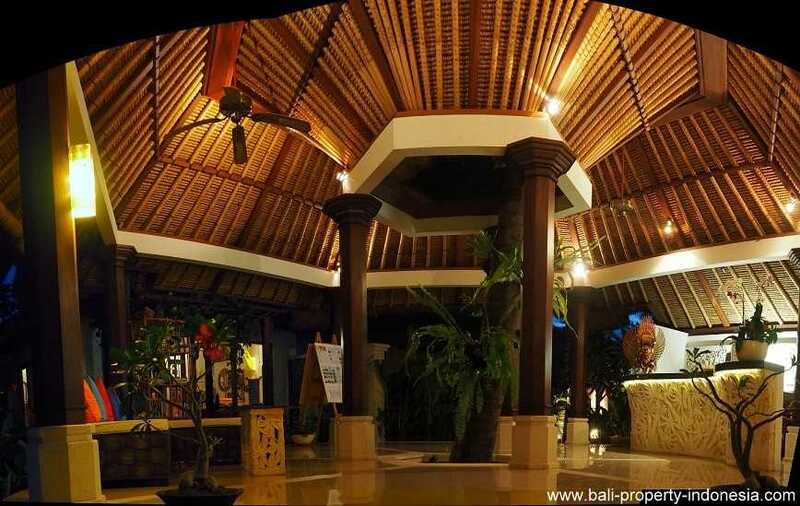 The whole housing environment is dominated by 41 mighty coconut palm trees with wide leaves providing a cool breeze and shadow. 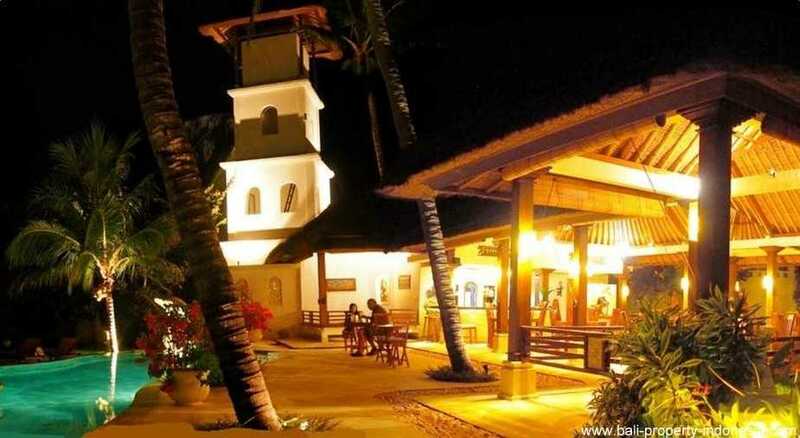 The resort creates a sensation of pure relaxation, mesmerizing beauty and harmony. 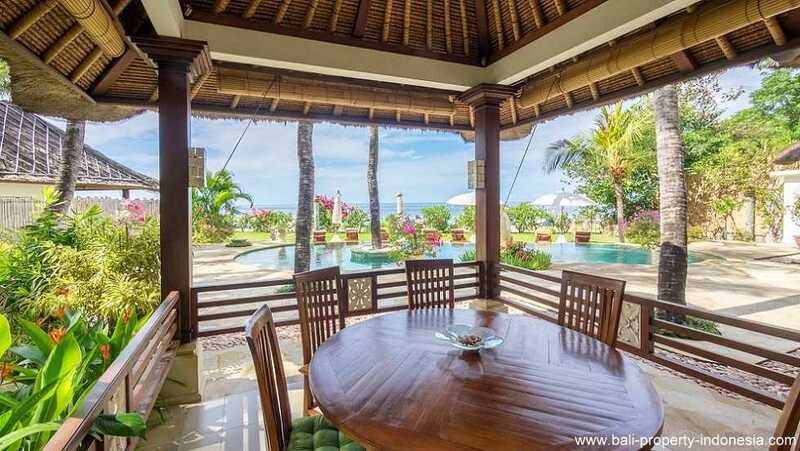 All five villas, surrounded by shadow-providing palm trees, profit from a stunning view. 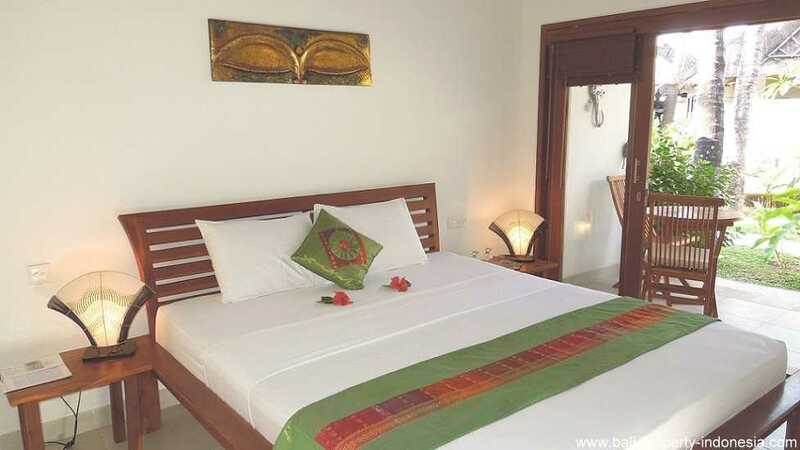 The rooms are bright, modern, comfortable and clean furnished with teak furniture. Each of the villas features a spacious living-bedroom with incorporated bay window serving the purpose of reading and relaxing (42 m2), a well-fashioned en-suite bathroom in semi open-air design encompassed by indigenous white stone facilitates a rain shower, a generously proportioned patio (15 m2) on the same level invites to be and enjoy on comfortable seating. Facilities: king size bed for 2 persons (2 x 2 meter), air conditioning, fan, hot water, mini bar, safe, hairdryer, Internet WIFI, semi open-air en-suite bathroom, private patio with table, 2 chairs and 2 sun lounger. 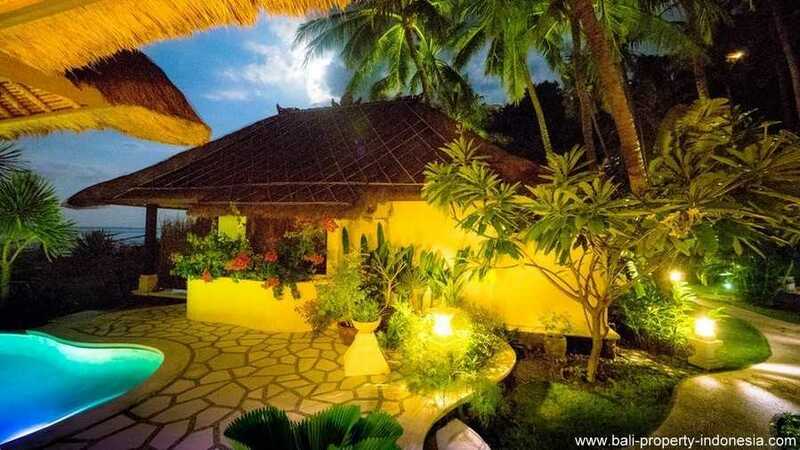 The three attached garden view bungalows (each 21 m2) provide modern, bright and comfortably equipped interiors. 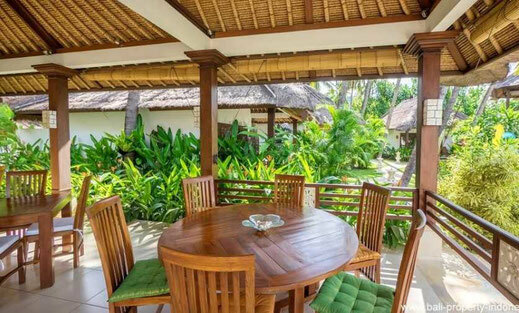 Exclusive teak furniture give the room its distinctive touch and create an atmosphere of comfort and privacy. 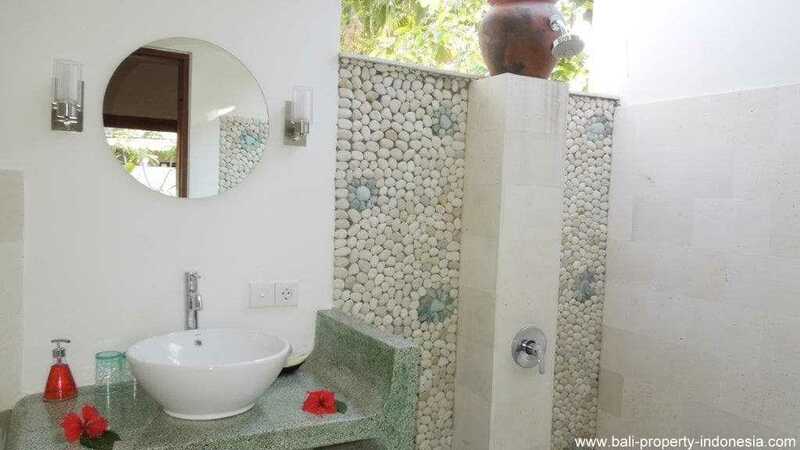 Emerald-cream coloured mosaics decorate the semi open-air en-suite bathroom; its floor is tiled with green nature stone. Facilities: double bed for 2 people (1.80 x 2.00 meter), air conditioning, fan, mini bar, safe, hairdryer, Internet WIFI, hot water, semi open-air en-suite bathroom, private patio (5 m2) including table and chairs. 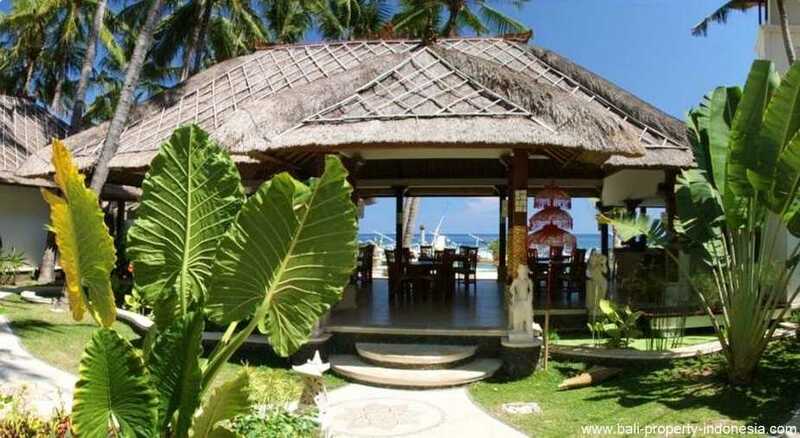 The Oceanfront villa is situated in excellent location by the ocean. It features a private swimming pool including private sunbathing area, both directly accessible from the patio. 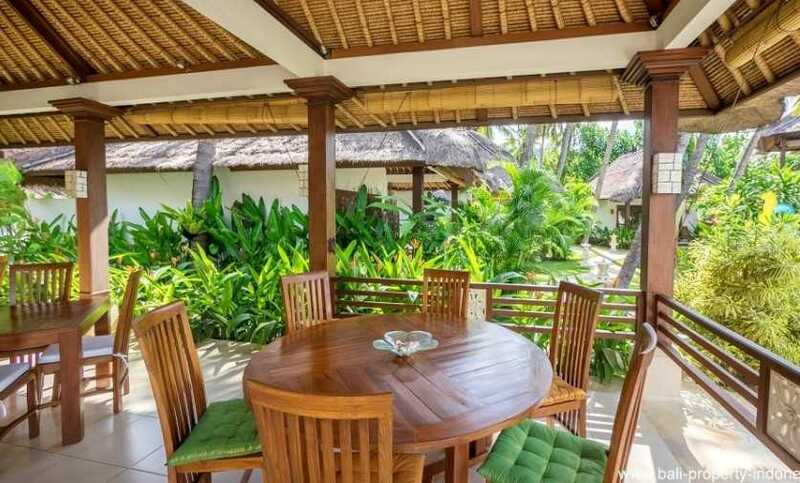 The roofed terrace (15 m2) furnished with rattan seating offers a view of delight. Early risers get rewarded by a glorious, all illuminating sunrise. 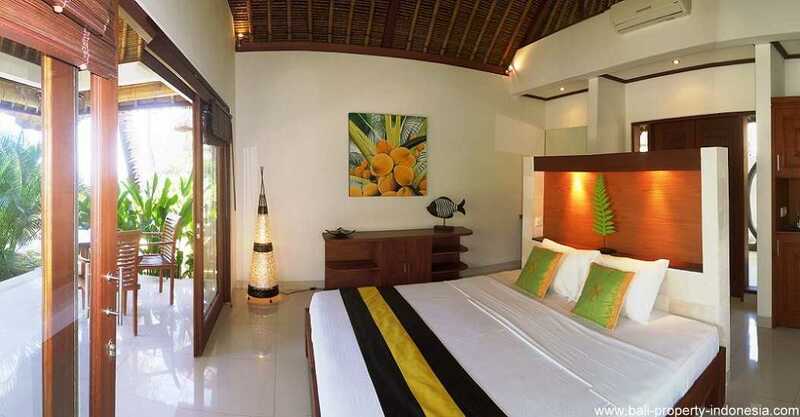 The Oceanfront villa ( 46 m2) impresses with its bright, spacious design and furniture made from tropical teak. A bay window with daybad invites to read and relax. The lavish en-suite bathroom in semi open-air design encompassed by indigenous white stone of finest craftmanship faciliates an extravagant rainshower. 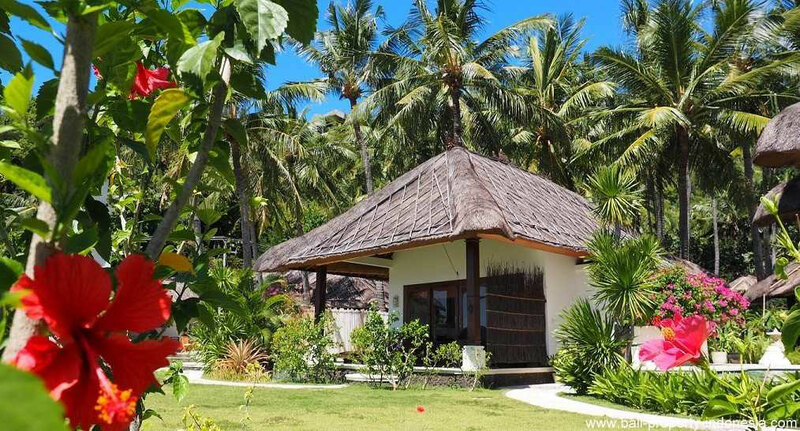 Facilities: king size bed (2 x 2 meter),air conditioning, fan, hot water, mini bar, safe, hairdryer, Internet WIFI, semi open-air en-suite bathroom, private terrace with rattan furniture, private swimming pool with attached sunbathing area, 2 teak sunlounger. 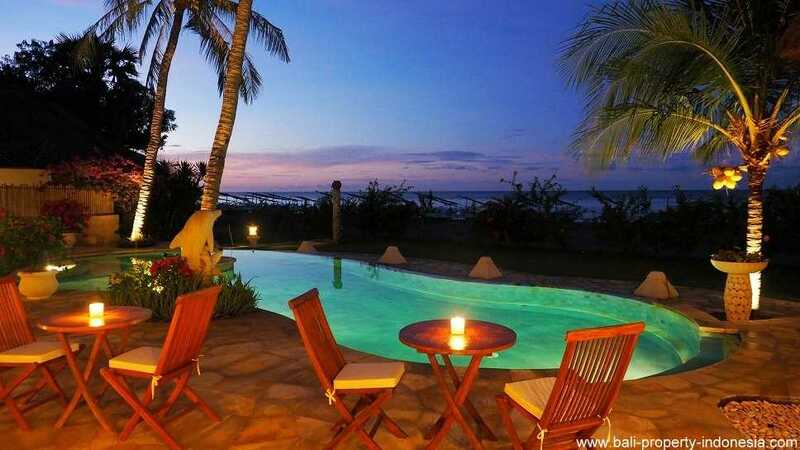 This luxurious villa comprises the most suitable option for a recreation home. Situated in excellent location and in immediate vicinity to the sea, it features a private swimming pool as well as a generously proportioned terrace with direct access to the private pool and sunbathing area. 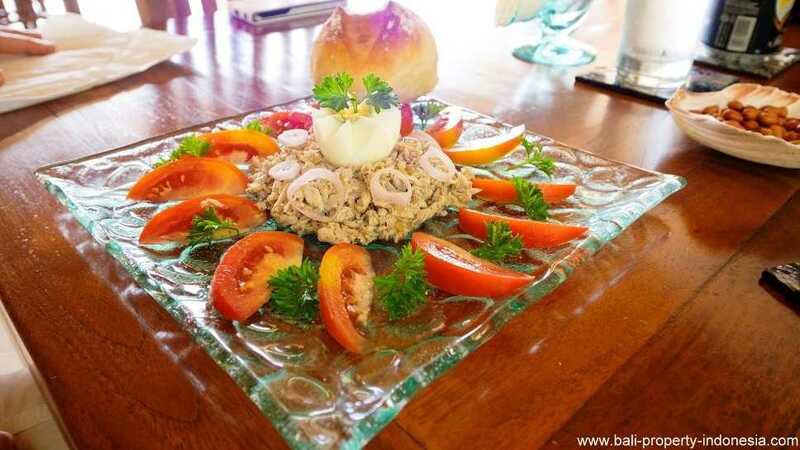 From the terrace, furnished with high quality rattan seating, enjoy an enchanting view over the whole bay area. Early risers will be rewarded by a magnificent sunrise on an endless horizon. 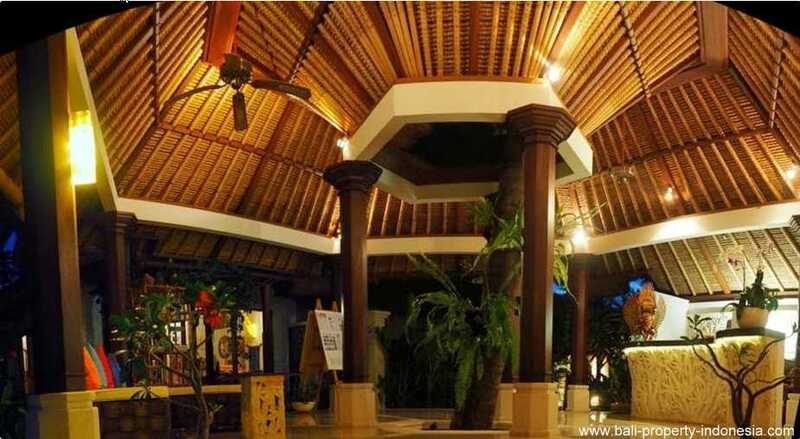 The villa represents a modern design with bright rooms and high ceilings. Handmade teak furniture greatly contribute to the sophisticated interior. A day bad in the bay window invites to read, relax or simply to stay and enjoy. 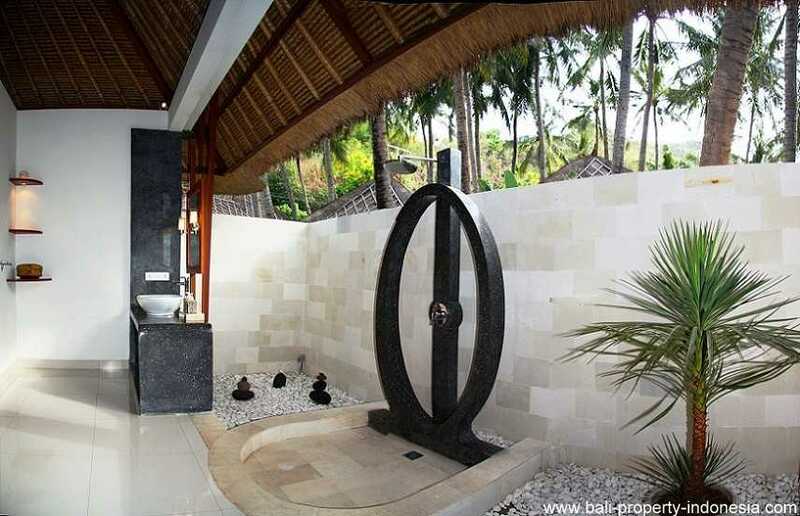 You will find a semi open-air en suite bathroom characterized by a unique view on the sea. Facilitated with both rain shower and detachable shower head, experience your very own wellness sensation in the surroundings of indigenous white stone walls of finest handcrafted quality. Facilities: king size bed for 2 persons (2 x 2 meter), air conditioning, fan, hot water, mini bar, safe, hairdryer, Internet WIFI, semi open-air en-suite bathroom equipped with two sinks, spacious private terrace, private swimming pool with sunbathing area with 2 teak sun lounger. 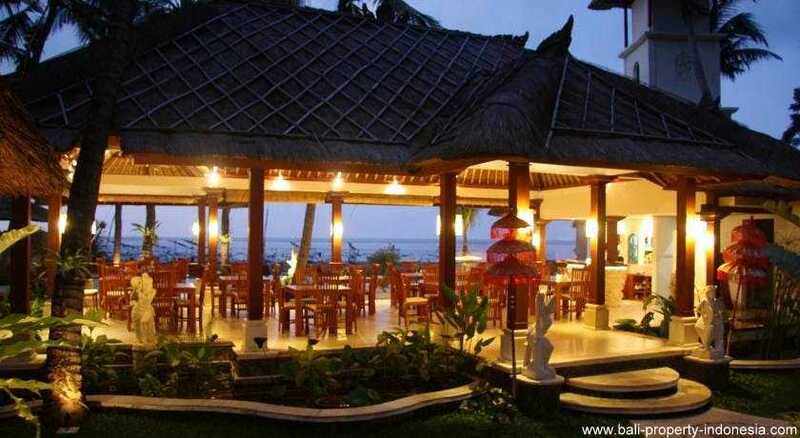 The semi-open restaurant is designed in traditional Balinese style. Its sophisticated conception and delicately crafted architecture express the distinctive character of Bali’s exceptionally rich culture. 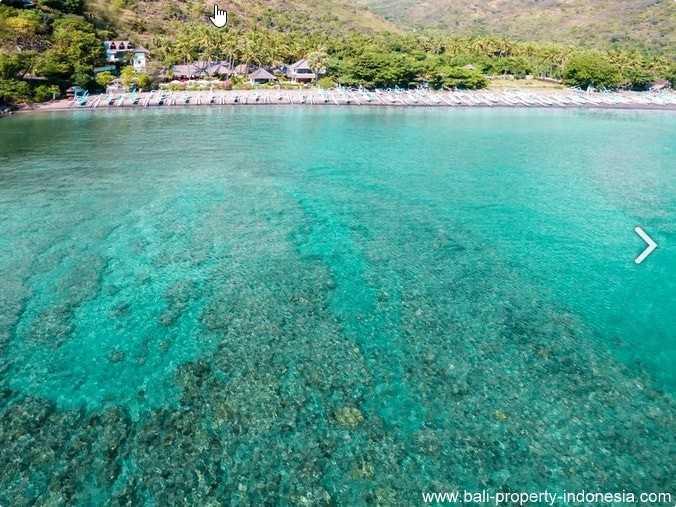 Closely situated to the sea you find yourself captivated by the soothing sound of the ocean surf and the colorful interplay of the turquoise-azure water on an endless horizon. The picturesquely elaborated fisher boats complete the scenery and let you experience an absolutely majestic view. Set in the heart of the resort’s idyllic garden, lies the epitomic of bodily harmony and wellbeing – our heavenly Spa. The circle is considered the perfection in geometry. In this spirit, the architecture exactly embodies this philosophy of paramount achievement and sensation. 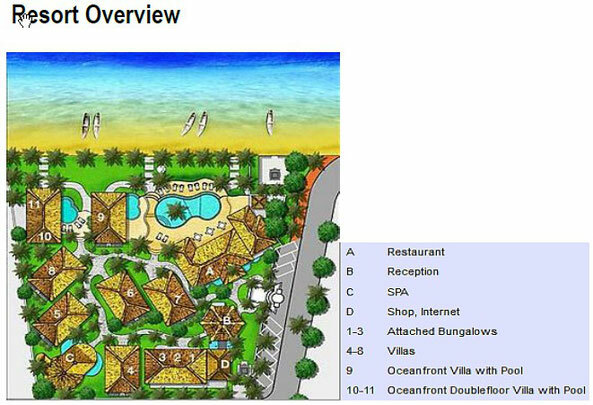 5 villas with semi open bathrooms, 3 attached bungalows and 2 Oceanfront Villas. Reception with lobby and library. Restaurant with kitchen, toilets and storage room. Tower with water storage and warehouse space. Freshwater swimming pool with mooring and 2 outdoor showers. Telephone and Internet WIFI (fiber optic connection).